New forum users, please introduce yourselves here. MWG members can answer most questions you may have. I met some of you last year at C2E2 and everyone was so very nice. I wasn't dressed that day but I currently have a Xcoser Kylo Ren Im using atm and I am slowly building to be more 501st approved. I just ordered a nice casted bucket from a facebook group that does some really nice work. Im also looking to learn how to build helmets and armor as I been bitten by this cosplay bug huge. I also really want to involve my son as well. The best thing that really drew me to the 501st is the charity events you guys do. Its amazing what a costume can do and how big of smiles it creates. This is something near and dear to my heart as I would do this for special needs children myself.I would love to help out on any armor build days just to get my hands wet at doing this. I appreciate your time and look forward to being a future member here. Welcome. We are here to help. If you are wanting help and guidance on joining our ranks, you will be getting some messages from our Welcoming Group and also given info to a Facebook page that we have for helping folks with their costumes so that you may join us, the Rebel Legion, or the Mando Mercs. "Go mbeidh an forsa leat"- May the Force Be With You. Im out near Lockport area. So went to the mighty con to test run the new Revan setup and so glad I did. Still, need to replace the rings and add red cloth as well. I have some boots but just need to find a piece of leather to glue over the top and paint them. Got a nice picture from my buddy that was with. 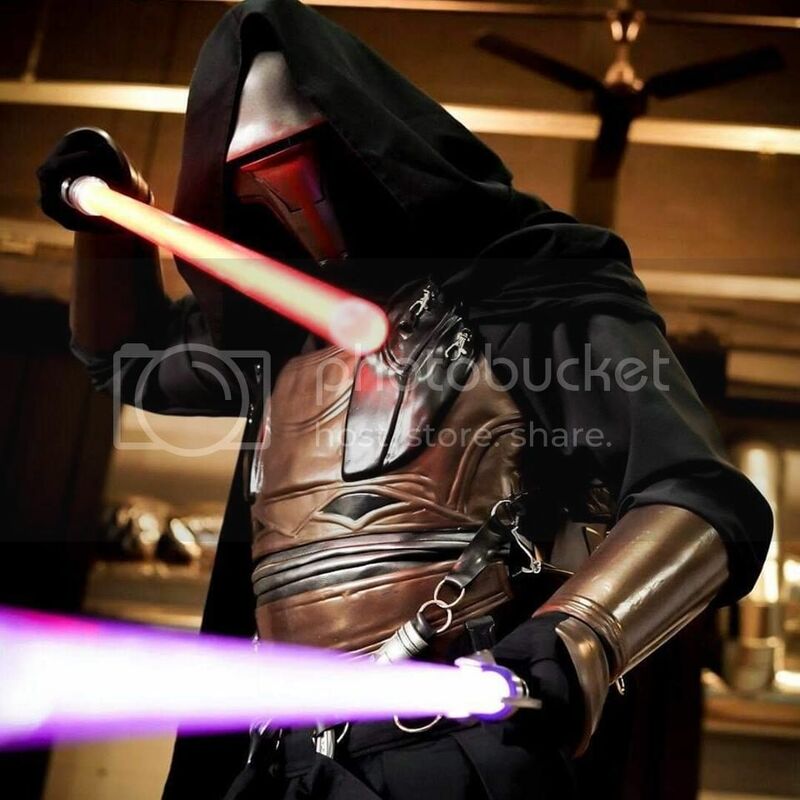 Slowly getting the Revan together for approval.